Ottawa, Ont. 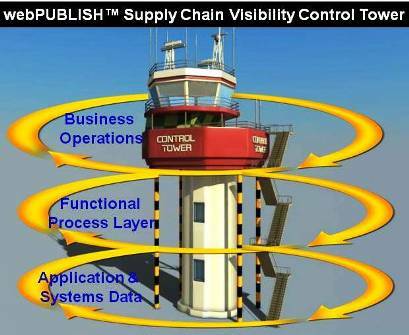 and Silicon Valley, CA; Jan., 2016 Pelyco Systems, a leading supplier of collaborative supply chain and logistics visibility solutions, today announced the launch of the webPUBLISH™ Visibility Control Tower. The webPUBLISH™ Visibility Control Tower allows companies to gain a more comprehensive and centralized view of their supply chain operations, helping them to improve operational efficiencies and cut costs. Companies are constantly striving for greater operational efficiency and have implemented powerful ERP and Supply Chain systems but do not have easy access to all their critical business data. This data is often dispersed across multiple systems and in different data formats. webPUBLISH™ Control Tower for Supply Chain Visibility provides quick and easy access to company data held in disparate systems and displays it in clear, intuitive collaborative SmartSpreadSheet™ for Enterprise views, sophisticated visibility reports and performance graphs. Pelyco’s portfolio of visibility solutions are designed to help companies of all sizes become more responsive to changes, cut costs and overcome the challenges of managing complex global supply chains.